I missed it in yesterday's Washington Post, but there was a long piece there by Sally Jenkins on the Cobbe Portrait controversy - is it, or isn't it, Shakespeare? The story is more than a bit overwrought ("The styled courtier who gazes out of the portrait is undeniably a seducer, and that much was true of William Shakespeare: He was an arch-persuader with language. But we didn't reckon he was such a looker. Frankly, we always thought he was a bald pudge. Whereas this man is bouffant and handsome, complicatedly so, with his doily of a collar and come-hither expression" are two lines from the first paragraph), and there doesn't seem to be much new in it, but the debate is interesting enough to make the eye-rolling worth it. Book Review: "The Founding Fathers Reconsidered"
"I propose to take the founding fathers down from their pedestals without knocking them down. At the same time, I set their achievements and their failures within the context of their own time and place, while making clear that those achivements were not great beyond the bounds of mortal men and that those failures were not blameworthy beyond human beings' normal capacity to err. If we rework our relationship with the founding fathers so that we meet them eye to eye instead of gazing reverently upward of sneering contemptuously downward, perhaps we can form a more pragmatic sense of who they were, what they did and failed to do, and why we care" (p. xi). Bernstein succeeds admirably in this. He examines, first, the roots of the term "founding fathers" (betcha didn't know it was Warren G. Harding in 1916 who coined the term! ), and tracks the reputations of the group and several of its individual members over the course of historical memory and scholarly debate. Bernstein offers his reader a glimpse into the cultural context in America at the time of the Revolution, and how that, combined with the wide variety of background experiences held by the founding generation, shaped their minds and lives. In the two longest chapters of the book, Bernstein discusses the achievements and challenges, as well as the legacies of the founding generation. This is the meat of the book, and these two chapters are perhaps the single best succinct synopsis of the issues I've read. Bernstein is fair-minded and writes with a clear and concise style, providing an in-depth analysis without getting bogged down in details. His lengthy and excellent footnotes will provide any interested reader with much additional reading material. A good introductory text to the cultural context and historical memory of the men we know as founding fathers. Recommended as such. 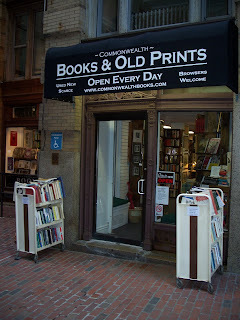 Boston's flagship outlet of Commonwealth Books has moved, from the old location on Boylston Street to 9 Spring Lane, just off Washington Street near Downtown Crossing (just steps away from their other shop under Old South Meeting House, and very close to both the State Street and Government Center T-stops). The new shop is now open for business, and if you're in the area, I strongly encourage a visit. The space is absolutely beautiful, with plenty of room for browsing (this space is about the same square footage on one floor as the old shop had on two), a really elegant layout, and the usual fine stock of good books. - In today's New York Daily News, a piece on David Gary's excellent research into the library of Rufus King, now at the N-YHS (a hopefully soon to be included on LT as a Library of Early America). I am quoted in the article as a "skeptic" of Gary's thesis, which I'm certainly not; I think his efforts will be much appreciated among the scholarly community and that we will be able to learn much from the research that he's doing about King in particular and the founding generation in particular. - From McSweeney's, Hamlet through a Facebook news feed. - Over at Frognall Dibdin's Shelves, a list of the author's favorite books about books, and at The Private Library, a rundown of histories of the book to include on one's shelves. - Dominick Donne, prolific author and journalist, has died at age 83. - In The Scotsman, a short piece on Jonathan Bate's decision to write a Shakespeare biography. - In the NYTimes today, news that the EU will propose loosening rules on "orphan works" and a broad range of other copyright changes to govern European books. - At the NYPL blog, Emma Carbone reviews The Physick Book of Deliverance Dane. - Apropos of this week, several new Samuel Johnson biographies and monographs are reviewed by H.J. Jackson in the TLS. - In the Financial Times, John Sutherland reviews several new books about books. Book acquisitions to follow; I haven't cataloged them yet. Although I was a wuss today and let some rain deter me from trekking out to Cambridge for the third and final day of the Samuel Johnson symposium at Harvard, the two days that I made it to were perfectly delightful. On Thursday morning Nicholas Hudson delivered a plenary address on "Johnson and Revolution" (particularly focusing on Johnson's views of the Glorious Revolution of 1688, the changing uses of the word "revolution" over time, and a discussion of Johnson's views of the American and other revolutions). Also on Thursday morning I attended a really fascinating panel on Johnson and America. As part of that, Thomas Curley (whose books I really must read, and he's got a recent one out on Johnson and the Ossian controversy which is going to move to the top of the list) discussed Johnson's views of Americans (they were not positive) and of colonialism and imperialism in general. Helen Deutsch then discussed a theory that Hawthorne may have been influenced by Johnson's story of doing penance of Uttoxeter Market and drawn on the motif for his portrayal of Dimmesdale in The Scarlet Letter. Finally, the very engaging and amusing William Dowling discussed Oliver Wendell Holmes' longstanding fascination with Johnson (Holmes' bicentennial birthday is today, by the way), and his conscious modeling of Boston's Saturday Club on Johnson's London Club of a century prior. This paper, delightfully delivered and incredibly well written, might have been my favorite of the conference. On Thursday afternoon the panel I attended was "Johnson, Boswell, and the Circle." John Radner (who is now writing a book on the Johnson-Boswell friendship) discussed Johnson's early correspondence with three friends (Robert Chambers, Bennet Langton, and Boswell); James Caudle discussed a parallel visit of Samuel Johnson and the poet Ben Jonson to the same manor house in Scotland; and Matthew Rusnak took us into the seamy underworld of London crime with a talk on Johnson's role as character witness in the Baretti murder trial (fascinating stuff, that). Gordon Turnbull gave a lively and incredibly funny response to the papers, which had everyone in the room laughing. Following the panels on Thursday we repaired to Houghton Library for a look at the new exhibition of highlights from the Donald and Mary Hyde Collection (online version here). It's an amazing show, so do make sure you get there to see it if you can. We were also allowed to purchase sneak advance copies of the exhibit catalog, which is positively gorgeous (and will be available from Harvard University Press later in the fall). Yesterday morning's panels were given over to the Dictionary: first a plenary discussion and then another follow-up panel of responses and additional comments. Anne McDermott gave a very intriguing paper suggesting that Johnson actually completed a full first draft of the Dictionary around late 1750, but then found himself dissatisfied with the work and just about started over again approximately a year later, taking another "break" after his wife's death and then finishing the work at a breakneck pace in the last eighteen months before it was published. This hypothesis sparked a few tough questions, but all agreed that the evidence is worth examining in greater detail. Jack Lynch then discussed Johnson's modes of definition, using a numerical analysis of those methods and comparing them to other dictionaries before or since. Many of the funniest parts of this centered on "Johnson's misfires," i.e. where he admitted to not knowing the meaning of a word, or defining it utterly circularly or uselessly ("defluxion" as "a defluxion"), but Lynch's useful beginnings of a method for classifying Johnson's definitions should be very welcome indeed. We also learned Lynch's favorite word from the Dictionary: anatiferous (producing ducks). I like it too. Finally, Allen Reddick examined Johnson's use of John Milton in his illustrative quotations and elsewhere, arguing that Johnson selectively used Milton's language in order to put down the author and "exact revenge" on Milton for his anti-monarchical views. Friday afternoon's panel was perhaps the most bookish of the lot, featuring some of the biggest names in book history scholarship. Terry Belanger discussed the penchant among English printers and publishers for the folio format (for certain genres of works, at least) as a symptom of the innate conservative nature of the English book trade. He examined the words per page, relative costs and survival rates among book formats, and noted that this talk might be, for him, the first toe "back into the waters of book trade history." James Raven, who could not attend due to a bout of the chickenpox, sent his paper (which Pat Rogers delivered in his stead), which examined the book trade community around Fleet Street during Johnson's time, drawing on his research into the London land tax records. Finally, Paul Baines discussed Johnson's relationship with Thomas Osborne, the bookseller who was supposedly beaten by Johnson (whether with a "great folio volume" or not). Baines' paper mostly centered on the game of "telephone" which morphed the story into various forms over the course of history. All in all, a tremendously interesting and very well-organized conference (kudos to John Overholt and Tom Horrocks and everyone else at Houghton for doing such a tremendous job!). Dr. Johnson would be proud. I'll be out at Harvard for the next three days at the Johnson at 300 conference, which promises to be great fun. I'll try to check in either here or via Twitter, so stay tuned for updates from the meetings. John Overholt notes today that the online version of the Houghton Library exhibition to accompany the conference and highlight the Donald and Mary Hyde Collection is now up and running, so do be sure to visit that (as well as the physical show, of course!). One of the Philadelphia Rare Books & Manuscripts catalogs out today is Provenance, in which some previous owner is known for each of the books offered. Great fun, and some really fascinating titles and owners. Thanks! We've gotten lots of questions about all the books John Quincy Adams is reading as he travels to Russia (via Twitter here). This morning I made up a list of what he's read so far in August, including links to scanned copies of the books in case anyone feels inclined to follow along (fascinating that I was able to find suitable editions of all the titles thus far on either Google Books or the Internet Archive). - Tony Campbell notes news out of the Czech Republic that a 47-year old Polish man, Piotr Stanislaw Peron, has been sentenced to five years in prison for the theft of a 1520 world map from the Scientific Library in Olomouc and the attempted theft of a 1599 map of northern North America. The court expelled Peron from the country for eight years and ordered him to pay 1.2 million crowns to the library as restitution. Peron has appealed the verdict. - Over at Houghton, John Overholt reports the arrival of the published catalog for his upcoming exhibit, "A Monument More Durable Than Brass: The Donald & Mary Hyde Collection of Dr. Samuel Johnson." I'll probably spring for a copy at this week's Johnson Symposium, which I'm really looking forward to! - Laura needs a job. Can you help her out? - In the NYTimes today, an article on the division among European publishers/libraries/&c. over the Google Books Settlement. Among the news here (to me at least) is that the judge overseeing the settlement plans to rule on it by 7 October. - Rare Book Review reports that a rare Popple map of North America (1734) will sell at auction next month. I'll keep an eye on it. - In Slate, Mike Steinberger takes a look at the fascinating Thomas Jefferson wine hoax, tossing in the juicy bits about the Rodenstock lawsuits, Michael Broadbent's attempt to sue Random House, &c. Great read. - J.L. Bell points out some great new online exhibits of interest: a Brown University Library sampling of Revolutionary War soldier art, and the National Portrait Gallery's exhibit of Thomas Paine. - Thomas Levenson's Newton and the Counterfeiter is reviewed by Laurence Phelan in The Independent. - Dennis Drabelle reviews Peter Mancall's Fatal Journey in the WaPo. - In the WSJ, Aram Bakshian Jr. reviews Thomas Fleming's The Ascent of George Washington. - Hobson Woodward's A Brave Vessel is reviewed by Ben Cosgrove for the San Francisco Chronicle. - McSweeney's Issue 19; edited by Dave Eggers (2006). Brookline Booksmith. - Among My Books by James Russell Lowell (Boston: Fields, Osgood, & Co., 1871). Brookline Book Annex. - Catalogue of the Library and Collection of Autograph Letters, Papers, and Documents Bequeathed to the Massachusetts Historical Society by The Rev. Robert C. Waterston (MHS, 1906). Brookline Book Annex. - Notes and Queries: A Medium of Inter-Communication for Literary Men, General Readers, etc. (Third Series, Volume Ninth, January-June 1866). Brookline Book Annex. Raymond Scott was formally charged today - for theft and for with an alternative charge of handling stolen goods in relation to the Durham First Folio case. The hearing in Durham Crown Court lasted just fifteen minutes, and no date was set for his next court appearance (media reports say the case won't go to trial until next summer, however). Scott maintains that he was given the book by a Cuban acquaintance of his girlfriend, and that it is not the Folio stolen from Durham University in 1998. The Northumberland Gazette adds that Scott answered "Aye, that I am" in response to queries from the judge. "He then gazed, with his head tipped back, at the ceiling lights as his lawyer discussed a date to fix his trial." In Scott-fashion news, the AP reports that the suspect arrived at court "riding a horse-drawn carriage led by a Scots piper. He wore a kilt, and swigged from a bottle of malt whisky outside the court." The Gazette gets specific: their piece says Scott "faced a judge at Durham Crown Court dressed in a kilt of Royal Stewart tartan, a Harris tweed jacket, cravat and a pair of limited edition £1,000 Fendi sunglasses." And the piper played "Scotland the Brave." Naturally. The NYTimes reports today that Amazon, Yahoo, and Microsoft have joined the Open Content Alliance and other groups in opposing the Google Books Settlement. The new coalition, which the Times says is tentatively named the Open Book Alliance, "plans to make a case to the Justice Department that the arrangement is anticompetitive. Members of the alliance will most likely file objections with the court independently." The DoJ is already examining the proposed settlement. Book Review: "Errands Into the Metropolis"
Errands into the Metropolis: New England Dissidents in Revolutionary London by Jonathan Beecher Field (Dartmouth University Press, 2009) is a fascinating and tightly-focused study of a particular culture of print: that of New England dissidents (specifically those connected with the Rhode Island settlements) publishing works in London in the mid-17th century. Field argues that these dissidents (including Rogers Williams, Samuel Gorton and others) "availed themselves of specific discursive opportunities produced by a historically distinct combination of political, cultural and technological circumstances" (p. 5). Field argues that the Rhode Island dissidents were as successful as they were partly because the distance required for the mediation of disputes (between them and their counterparts in the Massachusetts Bay and Plymouth colonies) allowed them to level the playing field: "to a degree, rhetorical ability in print could outweigh overmatched political power" (p. 5). Persuasive written accounts of feuds could win out, Field suggests, and did in a remarkable number of Rhode-Island-related cases. While some of this might have been a case of 'the enemy of my enemy is my friend,' I think Field's onto something, and his argument worked for me. Through close readings of certain dissident texts, including Williams' Key Into the Language of America, John Clarke's Ill Newes from New England and others, Field argues that the dissidents did more to shape their appeals to the ears and minds of their British readers, and deployed the goal of toleration as a pragmatic tactic, rather than some idealistic goal. A very succinct and finely-honed work, which is interesting from first page to last, both for its depictions of mid-17th century publishing practices and techniques, and for its intriguing argument. Recommended. - Via Publishers Weekly and the NYT's Bits blog, news that a group of University of California professors have raised concerns about the proposed Google Books Settlement from the standpoint of academic authors (their 9-page letter to the court charged with approving the settlement is here in PDF). UC faculty and administration reps have already endorsed the settlement. Many of the same concerns we've seen raised by others, and all good questions worthy of discussion. The professors also take the Authors Guild (one of the parties to the settlement) to task for not adequately considering academic authors in their negotiations. - The Bibliothèque Nationale de France has ended its feud with Google and will join the Google Book Project, French and international media reported yesterday (the front-page headline in La Tribune translated to "Google Has Won"). Denis Bruckman, director of collections at the library, said the decision to join Google was purely financial: "We will not stop our own digitising programme, but if Google can enable us to go faster and farther, then why not?" The Globe reports today on a neat find: a 19 September 1775 letter from Elbridge Gerry to the selectmen of Marblehead, accepting his selection as a delegate to the Continental Congress. "Historical Commissioners Wayne Butler and P. Chris Johnston stumbled upon the letter about two weeks ago, as they cleaned out a small room in the basement of Abbot Hall in preparation for the historic, red brick building’s restoration, Butler said. It was packed into one of the five metal cabinets in the room, which hold receipts, lists of stockholders, and other town documents that date back to the 1800s." Book Review: "The Painter of Battles"
Arturo Perez-Reverte's The Painter of Battles is quite a different book from his others. It reminded me very much of Iain Pears' The Portrait (my review), in that it's told from rather a strange perspective and deals with the whole issue of an artist's relationship with their subjects. War photographer-turned-painter Faulques just wishes to be left alone, but when the man from one of his most famous photographs shows up unannounced and declares he's there to kill, things take a meditative turn. There is much discussion of war and death, art and responsibility, power and the impact of events on those involved with them. What there is not, for the most part, is much of anything happening. If you're looking for a rollicking read, don't look here. But this is a fascinating examination of some heady issues. It is not my favorite Perez-Reverte (I'm a Club Dumas partisan), but the writing is lovely and the book will certainly make you think. Book Review: "The Mauritius Command"
Patrick O'Brian's fourth Aubrey-Maturin novel, The Mauritius Command, may be my favorite so far. He's retold in exacting detail the 1810 British campaign against Mauritius and Réunion, with the added bonuses of his excellent characters (Aubrey replacing the actual fleet commander, Sir Josias Rowley). We first meet poor Aubrey stewing at home, but good Maturin soon arrives and provides a good opportunity for escaping the confines of Ashgrove Cottage. Aubrey is put in charge of a small fleet destined for the Indian Ocean, to harass French shipping and take several of their island outposts. O'Brian, using almost all the actual names of ships and captains (with the exception of poor Rowley), weaves his tale expertly around the historical campaign, to great effect. A good addition to the series. Details on this are a little sketchy, but it appears that a 47-year old Hungarian man (currently identified only as "Z.V.") has been arrested in Spain after stealing nearly 70 maps from Spanish libraries and planning a major crime spree to hit other collections in Spain, Portugal, France and Italy. Police reportedly found that the man had "marked all the libraries he planned to 'visit' on a road map," and so far reports suggest that he wasn't interested in selling the maps, just keeping them for his own collection. Here's a nasty bit: "The man was prompted to steal historic documents after learning that ten Ptolemaic maps had been stolen from the National Library in Spain in August 2007, believing that if someone else had done it, he could too." In case you're following along, that's the César Gómez Rivero case. All of the stolen maps were recovered on Friday when the man was arrested, according to media reports. It's amazing how many things accumulate over the course of a week away. I've been spending the weekend playing catch-up, and still have lots to do. But here are a few links and reviews that came across the transom. I'll have more tomorrow on what may be a new case of map theft, our first in a few months. 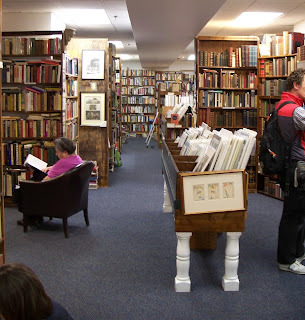 - Over at Book Hunter's Holiday, Chris asks "What is an antiquarian bookseller, anyway?" - In the LATimes, Allison Hoover Bartlett has an essay on the market for counterfeit dust jackets. - Thomas Levenson's Newton and the Counterfeiter is reviewed by Noel Malcolm in The Telegraph. - In the Christian Science Monitor, Marjorie Kehe reviews Paul Collins' The Book of William. - David Reynolds reviews Sally Jenkins and John Stauffer's The State of Jones for the NYTimes. - In the TLS, Alastair Fowler reviews several new books on theatre companies which rivaled Shakespeare's. - Also in the TLS, Jim Endersby reviews two new volumes of the correspondence of Sir Joseph Banks. I'm off for a few days beginning this morning, headed home for some family time. Apologies for the slow posting week: playing John Quincy Adams' social secretary-slash-publicist took up a surprising amount of time! (I've posted a roundup of all that madness here). Also, apologies for the short links & reviews roundup this week. I was pretty well swamped most of the time, so I'm sure I've missed many good links and things. Please feel free to add them in comments if you wish. - Rick Ring has a possible Franklin book from the PPL collections; I've added a comment to his post about some sources. Rick also posted some thoughts on the Nicholson Baker Kindle article this week. - Chris has posted some wonderful thoughts (and pictures) about her time at RBS this summer. - Via LISNews, some children's books that will never (and should never) exist. - The August Fine Books Notes is out. - Douglas Brinkley's Wilderness Warrior is reviewed by Jonathan Rosen in the NYTimes. First, I'm honored that PhiloBiblos has been included in two new lists of blogs today : L.D. Mitchell's Top 10 Book Blogs (Mitchell blogs at The Private Library), and in the Online School's 100 Best Book Blogs for History Buffs. Thanks for the honor! Second, some of you may have seen the impressive coverage we've gotten for the John Quincy Adams Twitter project (background here, follow JQA here). The AP picked up the story yesterday (sample article here - it's been, apparently, in several hundred papers around the world), and since then things have been a little intense. I was interviewed for that in the morning, then by the local CBS station in the afternoon (warning: video of me). Our librarian interviewed for the local Fox station. Today I spoke with Robin Young of WBUR's "Here and Now" program (here; warning: audio of me), and with the New York Times (that story should be in tomorrow's paper [update: it's here]). All that's been quite a time - interesting, but utterly exhausting - but it's been really something to see the reaction to JQA's project amongst the Twitterati (and the number of followers: as I type, it's getting close to 5,000!). Third, (and perhaps more importantly) if you're near Boston, make sure to go and see this year's Shakespeare on the Common production of "The Comedy of Errors." Great fun! It runs through 16 August this year, so don't delay. We went last night, and it proved a brilliant distraction from media-saturation madness. Highly recommended. - As the annual Shakespeare on the Common festivities kick off, Sam Allis uses his Globe column today to take a look at the strange phenomenon that is summer Shakespeare festivals. Which reminds me that I need to read "The Comedy of Errors" before we go see it Tuesday evening. - Don't forget to follow John Quincy Adams on Twitter: his trip to Russia begins this coming Wednesday, 5 August. Some attention to the project this week from the Globe's Brainiac blog, Bostonist, and Universal Hub (thanks all!). - News this week that former Christie's director Michael Broadbent is suing Random House over his portrayal in Benjamin Wallace's The Billionaire's Vinegar (which I reviewed here). The suit will be filed under UK libel laws. - The August AE Monthly is up, with pieces on the deaccessioning at USF, David Slade's thefts, and the Dunlap Discovery (the latter ends on a rather strange note). - Ian's been doing a great job blogging his experiences at Rare Book School this week, and today he adds some great quotes from the incomparable Terry Belanger (my favorite might be "If you can't figure it out, the trolls did it") and the wonderful remarks of Michael Suarez, Belanger's successor as head of RBS, delivered at RBMS in June. - Nicholson Baker writes in the New Yorker about ordering a Kindle and his early experiences with it. - In the LATimes, Roy Hoffman takes a look at the subtle art of inscribing books. - Much discussion in recent days about 91-year old Louise Brown, who joined her local library in 1946 and has taken out more than 25,000 books since then (and never once turned one in late). Impressive! - Writing in the NYT, Ed Park discusses the "invisible library," books that exist only between the covers of other books — as descriptions, occasionally as brief excerpts, often simply as titles." - Over at Liminal Librarian, Rachel posts on one of the most recent authorial dust-ups. - Paul Collins highlights the Awful Library Books blog, which is always very entertaining. - Michael Dirda reviews Richard Holmes' The Age of Wonder in the WaPo. - Peter Marshall reviews four recent biographies of Mary Tudor ("Bloody Mary"). - In the NYTimes, Brenda Wineapple reviews Caroline Moorehead's Dancing to the Precipice. - Over in TNR, a long exchange of views on Lincoln historiography, beginning with Sean Wilentz's "Who Lincoln Was" and extending through several responses. Here's what came this week, mostly the products of last weekend's bookshop circuit (the last for a while, thanks to the new sales tax hike), plus some review copies. - The King's Gold by Arturo Perez-Reverte (Plume, 2009). Publisher. - The Wilderness Warrior: Theodore Roosevelt and the Crusade for America by Douglas Brinkley (Harper, 2009). Publisher. - The Painter of Battles by Arturo Perez-Reverte (Random House, 2009). Harvard Bookstore. - The Mysteries of Udolpho by Ann Radcliffe (OUP, 1998). Raven. - The Castle of Otranto: A Gothic Story by Horace Walpole (OUP, 1998). Raven. - Mary and The Wrongs of Woman by Mary Wollstonecraft (OUP, 2007). Raven. - American Transcendentalism: A History by Philip F. Gura (Hill and Wang, 2007). Raven. - Athanasius Kircher: The Last Man Who Knew Everything by Paula Findlen (Routledge, 2004). Commonwealth. - Declaration of Independence: A Checklist of Books, Pamphlets, and Periodicals, Printing the U.S. Declaration of Independence, 1776-1825. With an appendix checklist of American Newspapers printing the Declaration of Independence by Stephen M. Matyas, Jr. (Privately Published, 2009). Commonwealth. - The Enlightenment of Joseph Priestley: A Study of His Life and Work from 1733 to 1773 by Robert E. Schofield (Penn State University Press, 1997). Brattle. - Early Printed Book Labels: A Catalogue of Dated Personal Labels and Gift Labels Printed in Britain to the Year 1760 by Brian North Lee (Private Library Association, 1976). Brattle. - The Untilled Garden: Natural History and the Spirit of Conservation in America, 1740-1840 by Richard W. Judd (Cambridge University Press, 2009). Brattle.